This document is for all scanlators who wish to become an active contributor to the Manga Reborn community and publish their own localized files to the site. Please refer to these guidelines for important information on fonts, cleaning, file types, etc. These are the standards for which we aim, here at Manga Reborn. For the sake of the online viewer, it is best for files to have a height which is a multiple of 400 pixels: 1200, 1600, and so on. That said, any image of relatively high quality will be accepted. The image should be cropped to the size of the page. Panels and bounding boxes should be parallel with the edges of the image. We encourage the use of Photoshop or Paintshop Pro. Photoshop CS5 or higher recommended but not required. Levels- Blacks should be darkened to black and whites to pure white, but without darkening or whiting out the middle tones. There should be no dust or scratches visible on the page. All of the original dialog should be removed to match the background color or texture before lettering begins. Choosing fonts is at the typesetter’s discretion, provided that the font comes from Manga Reborn’s list of pre-approved freeware fonts. The complete list of approved fonts, as well as their download links, can be found under the “Approved Fonts” section below. In the case of a longer series, a list of standard fonts may be decided on at a later date for the sake of consistency, should more than one lettering group apply to scanlate different chapters/volumes of the same story. If ever there is a non-listed freeware font which the typesetter wishes to use, we ask that you first get the approval of Manga Reborn by sending a message to contact(at)mangareborn.jp with the title “Freeware Font Approval Request” and include the name of the lettering group, the name of the font, the place where it can be downloaded, and the purpose for which it will be used. Note that fonts that require purchase and those marked as “free for personal use” will NOT be accepted. 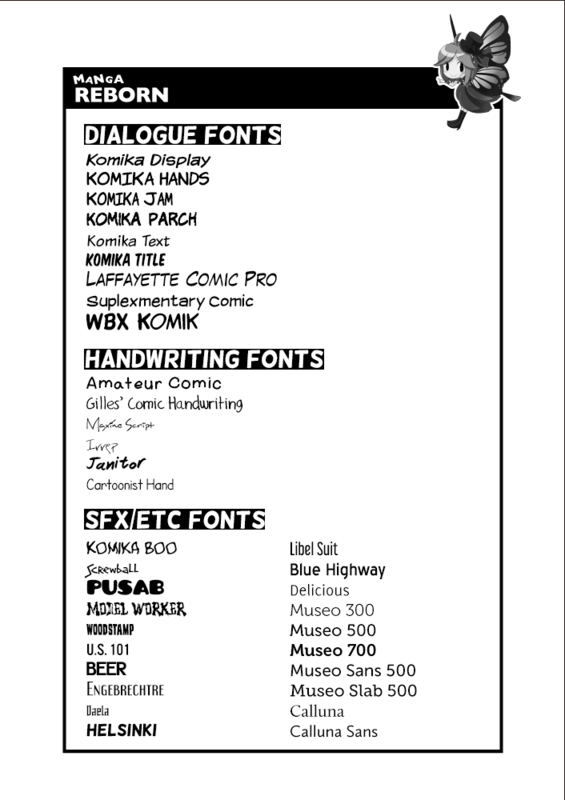 When searching for new fonts, you may want to refer to Manga Reborn’s list of free font downloads here: http://www.mangareborn.jp/forums/62/forum_threads/79. Please ensure that all fonts demonstrate some form of aliasing, as un-aliased fonts appear jagged and unattractive. All dialog, thoughts, and narration - center alignment, neither touching nor extending beyond the edge of its box/bubble. Try to leave a margin of empty space around the text where possible. Also, be consistent with the size of the font; do not change the font size for every bubble to fill the space, but use the same size font for all things (unless shrinking the size slightly is necessary to fit the text within its bubble or increasing the size is believed necessary to indicate yelling). Lettering notes (SFX, translation notes, etc) – unobtrusively near or along the edge of the page, panel, etc. Other text - matching the style and general effect of the original text. 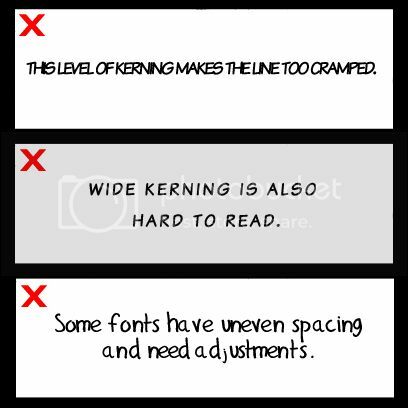 For the sake of superior quality, Manga Reborn asks that you keep these tips in mind when lettering your comics. 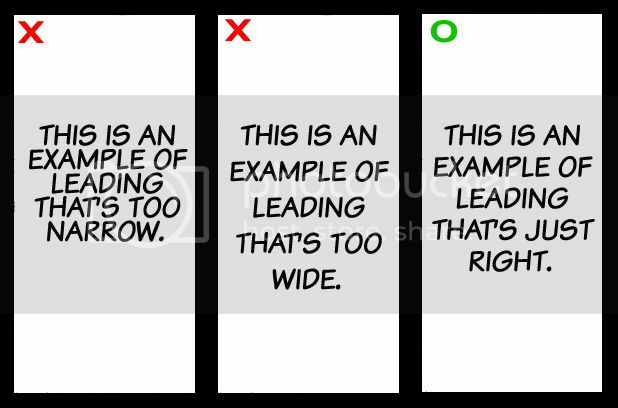 Leading – This is the empty space between lines of text. Text becomes hard to read both when the lines are too close together and when they are spaced too far apart. Every font has a different default setting, a great majority of them set too wide. The ideal amount of empty space is approximately 20% of the overall height of the font. Please refer to the table below for an estimate of what values will result in proper leading. Kerning – This is the spacing between letters in a word. As with leading, text becomes difficult to read when the space is either too little or too great, but unlike with leading, there is no recommended value. In addition to the overall spacing of a line of text, it is important to pay attention to the space between letters within individual words. If a particular font leaves too much or too little space surrounding a particular set of letters within a word, to the point where it appears incongruent and is distracting, then adjustments to the kerning may be necessary. See example below. Rag – This is the “shape” created along the edge of multiple lines of text. 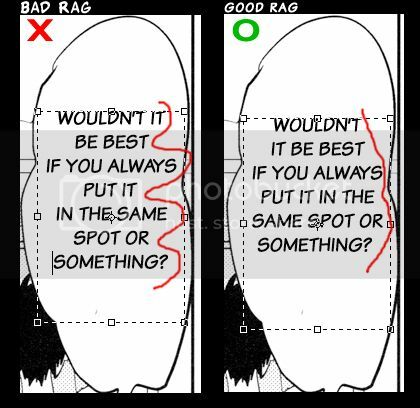 Ideally, the rag should slightly uneven, but not repetitively so. Try to avoid large gaps or jumps in the length of lines of text. A jagged edge to the text is both unattractive and hard to follow. In order to avoid this, create new line breaks in the text and make adjustments to the kerning of individual lines, stretching or compressing them, to bring them close but not entirely even with the surrounding lines. See example below. If there is ever a situation where a line break in the middle of a word is necessary, for either space constraints or aesthetic reasons, please use careful judgment. In most cases a word should be split between its syllables. If a word has a letter repeated twice in the middle of it (for example “repellant”) then place the line break between the two repeated letters. Also, never leave a single letter sitting alone on either side of a word break. When a line break is placed in the middle of a word, also add a hyphen to the end of the upper line, in order to indicate that word continues onto the next line. Sound effects are NOT to be ignored. 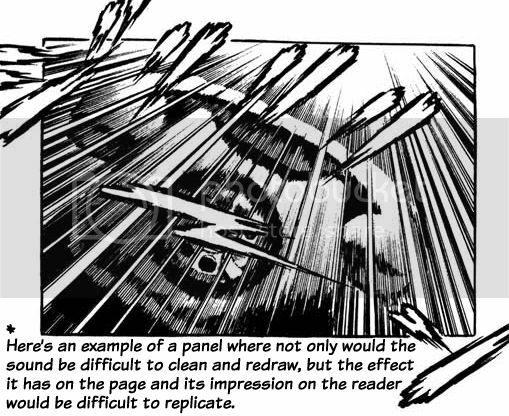 Redrawing and replacing a sound effect with its translation is encouraged, but not required. At minimum, a typesetter must indicate the meaning of a sound effect in a note labeled “SFX: ____,” placed unobtrusively on the page (such as along the inner or outer edge of a panel, as noted in the “Text Placement” section), using a different font from that of the dialog. If the translation is placed a fair distance from the sound effect, a pair of asterisks (*) should be used to show correlation. In any instance, the letter case of the sound effect should reflect the nature of the sound. For example, a large boom would be written in all capitals. A small flutter would be lower case, and a person laughing may be written in both capital and lower case letters. Any sound effects that one would not consider pivotal to the general effect or composition of a page* may be erased and (in the case of overlapping) the picture underneath redrawn. This includes bounding boxes, screen tones, and the drawing itself. When redrawing, line width and quality should be matched to and blend with the original. Likewise, patterns should be in some way copied and aligned to match with the existing tone, so as not to distract the eye. Photoshop’s content aware fill tool is ideal for this, but a clone stamp tool or simple copy & paste can also suffice. When selecting fonts (see the above Fonts section), matching the tone and feel of the situation supersedes matching the appearance of the original text exactly. Use the original more as an inspiration and a reference when deciding the placement, curve, tilt, and additional effects given to the font. Again, DO NOT use vertical text. In any instance where text is found within a colored text bubble, that color quality should be retained when the original text is removed. In other words, the cleaner should not white out text that appears on a red background but should cover the text with a matching red. Likewise, if ever text is written in a color other than black or white, the typesetter should match the color of the original font. We ask that all localized releases include an extra page of credits listing the title of the work, original manga artist(s), provider (MANGA REBORN), translator(s), cleaner(s), and typesetter(s). Additional names and special thanks may be added as needed. Your credits page should end with the number 999 to ensure that it appears at the end of the localized chapter or volume and does not alter the order of the pages for when they're viewed in 2-page mode. For your convenience, MANGA REBORN has two official credits templates available for download here: http://www.mediafire.com/?96fveerp9bi41d4. The fonts used in these templates are Engebrechtre, Libel Suit, and Blue Highway (download links available in the "Approved Fonts" section above), but scanlators are welcome to substitute in other approved fonts as they wish. Please do not add any additional pages aside from the credits page. This includes recruitment pages, special thanks, fanart, colored manga pages, etc. Editing- The typesetter is responsible for checking over all of his or her own work, looking for mistakes in typing, forgotten lines or sound effects, and ensuring the overall quality of the completed pages. When you have finished editing and saving all of your pages as .png files place them together in a zip file, which you may then upload to the Manga Reborn website. 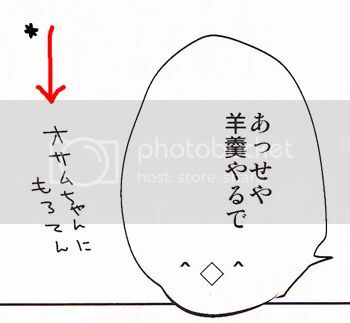 To upload a scanlation, first go to “My Page.” From there click “Publish,” the “Localizations” tab, and “Add New Localized File.” Your scanlation will be visible to the public as soon as it receives approval from the administration. Given the whole issue with localizations and copyrights, do you have a list of approved manga? On Mangahelpers, NJT said that scanslations were fair game but didn't elaborate. I want to know if I can restart a series before calling the team together again. All series on MR are here with the author / artists permission. So pretty much all series here are fair game as far as lettering or translating for that matter goes. Any other series that is not hosted here or that you don't own / have the rights to is not allowed.